Il fera tout et n’importe quoi. He’ll do anything and everything. N’importe quoi plutôt que ça ! Anything but that! But the fun and incredibly useful expression is informal and means "nonsense" or "rubbish." Mais tu dis n’importe quoi ! You’re talking nonsense/rubbish! C’est (du) n’importe quoi ! That’s nonsense/rubbish! 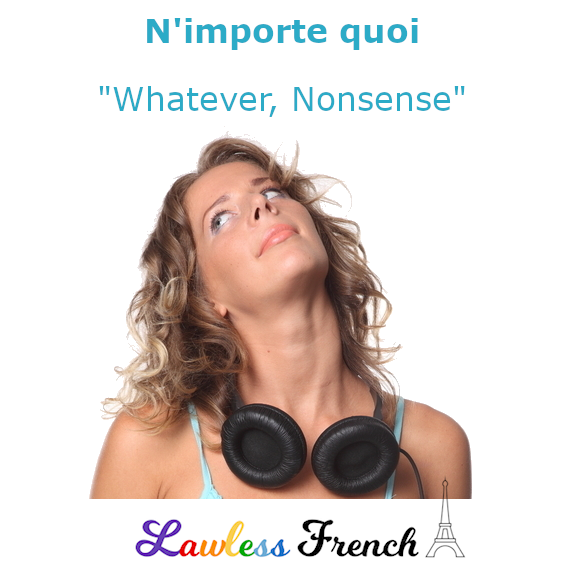 Also, while n’importe quoi isn’t quite the same as the dismissive "whatever! ", it’s the closest French equivalent I’ve found. N’importe quoi is part of the motto of the French prankster and video maker N’importe qui (né Rémi Gaillard). Literally “It’s by doing nonsensical things that you become nonsensical” but perhaps better translated as “It’s by doing anything that you become anyone." This is a play on his stage name as well as on the French proverb C’est en forgeant qu’on devient forgeron – literally, "It’s by forging that one becomes a blacksmith," but idiomatically "Practice makes perfect."